Cheap and nice, what more do you needsubmitted by Elizabeth H. - Nov 29, 2018 |Recommended: YesIt is a really nice complex for the price. Parking is not the best, its really hard to get a spot close to your apartment, but there is always somewhere to park. This property has great staffing, but costs way too muchsubmitted by Michael M. - Nov 29, 2018 |Recommended: YesI take really good care of my apartment, and I'm really happy to stay here again because it's such a nice place, but paying 415 a month doing all the household chores really bothers me...I feel oversold and underappreciated. That being said, the office staff have been remarkable in their kindness and hospitality. I appreciate the amenities, and the landscape is always in good condition...so mixed feelings overall about Raintree Commons. If I had a lower rate, I'd be happy to stay even a full year in contract. I think the property is well kept and is a great place to live.submitted by Kylie H. - Nov 28, 2018 |Recommended: YesI would tell them it is a nice and fairly cheap place to live. Its a very social complex with lots of activities always going on. And it is kept really well. I love the overall environmentsubmitted by Jilleeann W. - Nov 28, 2018 |Recommended: YesRaintree Commons is a great place to live, I have been able to meet some of the greatest people and created some wholesome friendships. The staff are wonderful people willing to help when needed. The social aspect of this complex is awesome, there is always something to do whether it be on your own or something the complex puts on. Welcoming, respectful, timely, nice, enjoyablesubmitted by Krystal W. - Nov 24, 2018 |Recommended: YesIt is a fun clean environment with activities. Nice apartments with fast service if needed. Very good place to livesubmitted by Binea B. - Nov 23, 2018 |Recommended: YesLovely location and fun community. With lots of fun events and such. 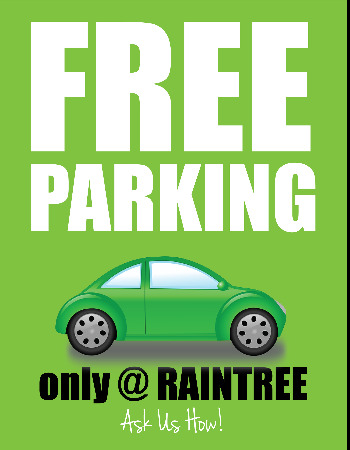 Raintree is Greatsubmitted by Levi P. - Aug 31, 2018 |Recommended: YesIt's a great place to live. There's lots of great people, and there is always things to do. There's a nice little park, and there's a pool and hottub as well, plus the bus is just right outside. I love it here. It's a cozy place, but the apartments are dark.submitted by Hilda F. - Aug 04, 2018 |Recommended: YesThat is a place to welcome and fun. A good balance of needs and amenities.submitted by Eric B. - Jul 30, 2018 |Recommended: YesRaintree provides a nice environment and good accommodations for most students. The grounds and common areas are maintained for the most part, and the staff is welcoming. The apartments are decent and provide the basic necessities. The apartments aren't anything spectacular, but they do show that management has done enough upkeep to maintain a nice place to live for students. The community is typically very welcoming and friendly, and overall a lot of fun once you get to know your roommates and or neighbors. Every once in a while, Raintree hosts events that are decent and fun. However, even with all this praise, there has to be some downsides to Raintree. In my opinion, the biggest downsize is the price for Fall Winter contracts. My apartment price is 389 a month, which I believe does not include parking 15 a month , and it also does not include utilities avg. 22 a month . I personally believe that for a shared room, that is price too high. It needs to be about 50- 60 lower. However, if that was for a private room, that is a good price range. This goes into my second complaint, of which there is no option for a private room during the Fall Winter semesters. A couple apartment issues that I've had is that you can't have too many appliances running at the same time in the kitchen or else you will trip the breaker i.e. Microwave and Grill . The last complaint I have is that the A C didn't work very well in my apartment. I would leave the thermostat set to 72 degrees and come back and it was 78 degrees on average. Now, some of that could have been my roommates, but most of the time, they left it alone. I figured that rise in temperature was due to a smaller compressor outside for my specific apartment vs. the larger compressors that most apartments have. The other issue with the A C is that the central air vent in the hallway can be very loud when it is on. I found it very hard to watch TV and understand the actors because the vent could be very loud. Overall, I would still live at Raintree. The environment is nice, management is nice, and overall the feeling of the complex is nice compared to all the other ones I looked at before I moved in. As I stated before, the biggest gripe I have with the complex is the price.